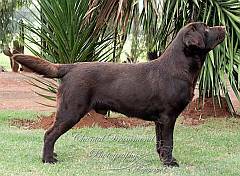 Labrador Puppies & Labrador breeders in South Africa. This breed is thought to have originated in the geographical area called Labrador, the Newfoundland area on the east coast of Canada. We have two litters available. 1st litter: Yellow females born 2 February 2019 out of Dam: Lambrada My Girl Lollipop HD A2A2, ED 00, PRA carrier and EIC clear, and Sire: Ablesing A Perfect Storm at Lambrada HD A2A2, ED 00, PRA and EIC clear. Pups are ready to leave for their new homes from 9 April. Denise Hopley 082 417 2686 or 011 6263490 (work) alberden.labradors@gmail.com or buying@trekscale.com. Webpage: Alberden. Sharron Brown 0828307291, email, webpage: Conkasha. It is a privilege to be part of such a GOOD website as Pets Place. I always ask the buyers where they've got our kennel name and at least 80% say Pets Place. Hannatjie, Yorma Puppies. The dogs were used by fishermen to go into the water and pull the fishing nets to shore. The Labrador's thick, short coat protected him from the cold water & severe, icy weather. Labradors love water, and care must be taken not to let a puppy go near a pool, or it will drown, as it does not know how to get out. Fully grown dogs will love to get into water, & to play with a hosepipe. The Labrador became popular in England as a gun dog and was used to retrieve game that the hunter had shot. 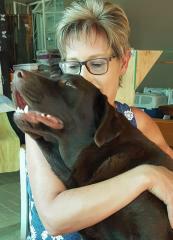 Children get along well with Labradors and the dogs love to play and to be kept busy. A bored dog can be destructive. The Labrador is easy to train. They are good natured. Labradors have often been used as guide dogs for the blind, and have been trained to assist people in wheelchairs. The word "retrieve" means to find and bring back, e.g. wounded game. Being a "retriever," the Labrador loves to carry and fetch things in his mouth. Use him to fetch things you drop! Labradors are large, strong dogs who love to go for a walk or a swim. They like people and make great companions. Mind you don't get whammed by a wagging "otter" tail! Labrador puppies are loveable, but once the dog reaches adolescence, it becomes a boisterous strong dog, who can knock people over, so do train your Labrador puppy to be obedient. Colour: black, chocolate, or yellow. The "golden" Labrador retriever is now called "yellow", so as not to confuse it with the Golden Retriever, which is a different breed. Height at shoulder: males 56 - 57 cm, females 54 - 56 cm.